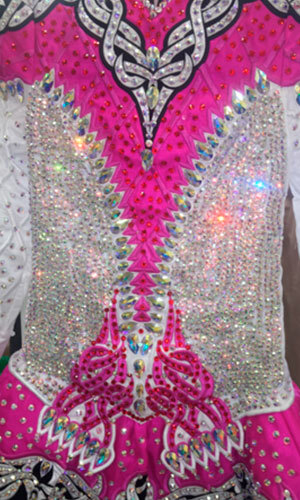 An Irish dancing costume is a very expensive necessity in a competitive dancer’s life. Appearance is important to say the least! So taking proper care of your dress goes a long way in keeping it ready for stage at all times and also adds value to the dress when it becomes time to sell it on. 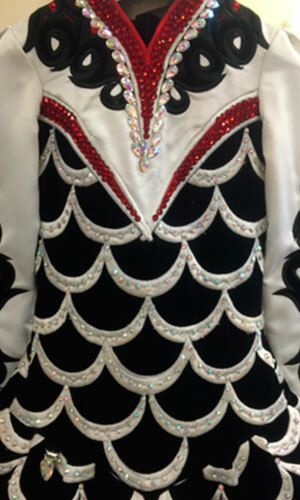 We here at Keady’s Drycleaners clean all costumes from simple class/team costumes to the high end solo dress complete with all their Rhinestones and Swarovskis!! Being the mother of an Irish dancer for almost eight years, Nollaig has cleaned a lot of costumes in her time. They are very time consuming to clean and the solo dresses have to be cleaned by hand while the class/team costumes can be either dry cleaned or washed based on materials. The cost of cleaning Irish dancing dress vary depending on size. The normal turnaround time for the cleaning of a dress is one week.